Handcrafted in Nicaragua, Mi Amor exudes decadent notes of dark cocoa, crisp spice and rich espresso. Mi Amor appoints beautiful Maduro wrappers grown in San Andrés to envelop a mosaic of medium- to full-bodied, aged Nicaraguan tobaccos. La Aroma De Cuba, the aroma of Cuba, was a cigar line that was well known and well-loved from Cuba back before the Cuban Revolution. It was loved by people all around the world, including one of the most famous cigar-smokers of his time, the witty and intelligent Sir Winston Churchill, who was rarely seen without some sort of cigar within reach. 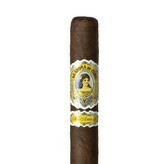 The La Aroma De Cuba Mi Amor Magnifico is a darker cigar, but that is common of the La Aroma De Cuba line of cigars. It is not made by Ashton, but rather made for Ashton by Don Pepin Garcia, one of the best-known manufacturers of cigars and a man who regularly puts out some of the most quality products through his cigar company, My Father cigars, that you can find on the market. Handcrafted at the My Father facility in Esteli, Nicaragua, they are well made with a lot of Cuban influence. To begin with, the tobacco is Nicaraguan long leaf from some of Nicaragua’s top fields, rolled up in a Cuban-seed wrapper from Mexico. The flavor that the wrapper imparts, though, is something that must be experienced. It is a dark flavor, medium-full and filling, with espresso and coffee to be tasted throughout, as well as hints of earth and pepper. The slightly oily wrapper provides the cigar with a nice touch of color to the smoke, and the dark coloration of the wrapper shows you that you’re in for a full-flavored smoke that is best enjoyed on its own. A must-try for anyone who likes Cuban seed or who enjoys a good dark cigar.